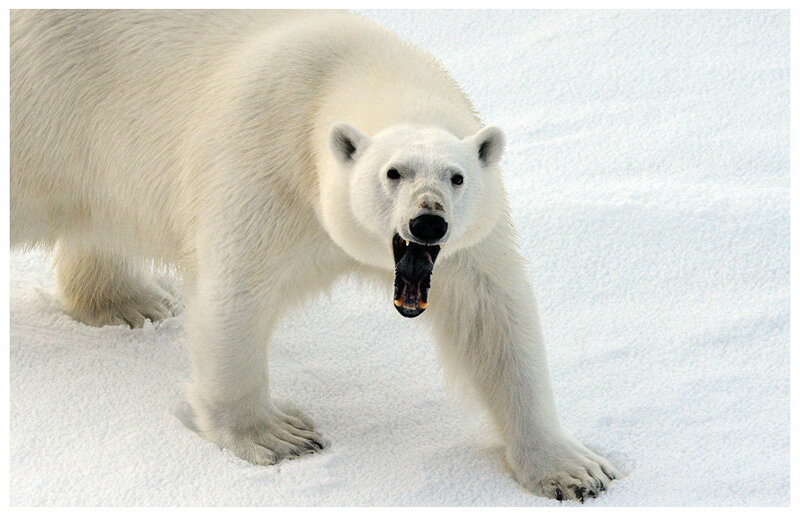 International Polar Bear Day is marked every year on February 27. The day is to raise public awareness on the bear preservation issues. Arctic.ru has published this interview with leading researcher at the Beringia National Park Anatoly Kochnev on polar bear behavior and their relations with humans. The text was written by RIA Novosti correspondent Nadezhda Yegorova. Environmental and conservation groups use Polar Bear Day to raise awareness of ice thawing, which is one of the principal threats to the polar bear. The animal is included in the Red Data Book of Russia and the IUCN Red List. Polar bear hunting has been illegal in Russia since it was officially banned in 1957. Still the animals are becoming more scarce, in part due to the friendly attitude toward them by urban residents, who see them as adorable and cute. Encouraged and fed, bears wander into ethnic villages where they end up being killed. Kochnev has been studying polar bears since the early 1980s. His longest spell was a decade on Wrangel Island in Chukotka, which lasted from 1989 to 1999. The Chukotka people call the island Umkilir, "White Bear Isle," and it is, in fact, their nursery, Kochnev says. "Fewer bears are observed along the Chukotka coastline, but I encounter them every year. I've noticed a pattern: when bears band together in a large group, their behaviour changes, becoming more tolerant toward other bears and humans. They get curious, come up close, try to play with you or even taste. When on their own, bears are usually wary of humans, and will run away if they meet one. Also, here in Chukotka, bears have always been hunted, so they avoid us," the researcher says. He says that when part of a large company with lots of food, for example whale or walrus carcasses at their disposal, bears become friendly and treat humans like some kind of "ugly bears." They start to use the same behavioral patterns with humans as with their counterparts. They play. "I once saw 11 bears pile together near the shore, frolicking in the water, playing, wrestling. There were females with cubs as well, one happy group. They show interest in humans by coming up close, which is especially true of cubs. It is dangerous in any case, because any time a bear plays with a person it can end badly for the person," Kochnev says. Photos posted earlier online showed a bear playing with an Arctic fox. Later shots show the fox to be dead. Another story had a polar bear caress laikas in Canada. The owner set up a tourist attraction by tying up his dogs and allowing them to be touched and played with by local bears. The story did not have a good ending, Kochnev says. A new bear came who was not accustomed to dogs, and killed them. "Neither humans, nor domestic animals should play with bears. It is not a good idea to treat wild creatures as adorable pets. In the recent decades people have become too cute with wildlife. This is not good for the bears. The popular belief that polar bears are not dangerous, that they are cute and so on can have dire consequences, because people come up here to the north to build and work, and they treat bears like cartoon characters," Kochnev says. Incidentally, it was around the time that a popular Soviet cartoon, Umka, about polar bears was released that this belief started gaining ground. A famous photo taken during this period shows a northern hunter giving a female bear with a cub a can of condensed milk. "The photo led to tragedy. The hunter lived in a village on Cape Schmidt. He decided to feed a bear and her cub. The animal was later killed. Maybe the man was familiar with these bears, and wasn't afraid of them. But he set an example for others, who also went to feed them condensed milk. The female hissed at the people, who grew scared and shot her dead. I wish the hunter had left the animal alone," Kochnev says. Kochnev says people share online photos and videos that show builders and oil workers feeding bears. Those taking such pictures do so to boast to their friends. Bears, however, get used to seeing humans as a food source, and make forays into villages, including ethnic villages. "The people there aren't affected by the trend to treat bears like pets, they'll kill the animal on site. Chuckchee and Eskimo people are very consumerist about this. If a bear wanders into a village, they kill it, and won't tell anyone about it. Indigenous people eat bear meat. Hunting these animals has been outlawed in Russia for 60 years, but in all that time the hunting has never stopped. The Beringia National Park is working with locals on this, because the bear is a vulnerable species, and we need to treat it differently. If there is a possibility for the bear to leave alive, you need to make sure as long as possible that it does," Kochnev says. Apart from the loss of ice, the main habitat and hunting ground of the bear, the culture in ethnic villages is to blame for human-bear conflicts. Villagers are used to disposing of waste meat on the seashore and storing fresh meat in wooden sheds. Attracted by the smell, the bear will go to the village in the winter. "There are hundreds of such cases. Bears will take food from dogs, or they can take the dogs, too. People need to reconsider the way they live to make sure food waste is not left lying openly on the ground. The largest numbers of bears were recorded in the 1980s but ice was in abundance then, and the bears barely came ashore and didn't come in contact with humans. Ice is scarce now, and the bears will go to the shore in search of food. Meanwhile, all ethnic villages are situated along the coastline close to seal rookeries. That's where the bears will go," Kochnev says. He adds that despite 20 years of working with the local population, all they have managed to do was to establish a bear patrol at two villages to scare the animals away. On the whole, their lifestyle has not changed as locals still need money to buy modern refrigerators or construct metal buildings to store meat. "Also, an intruding bear is an additional source of meat for them. There was never a tradition of scaring a bear away from the village. Those who can recall older beliefs say that if a polar bear wanders into the village it means it has brought humans its meat and pelt, and is to be killed, revered and thanked. There used to be a lot of rites when a bear was killed. Villagers would make a feast, all of them would gather around, there would be rituals performed with the bear's head. The animal was thanked, and bid an honourable farewell. Its head would be fed, and the people would call on its soul to grow meat and pelt and come back. There was drumming and dancing," Kochnev says. On one hand, locals killed bears, on the other, they treated them with respect. The hunting ban drastically changed local views. Kochnev says that in 2010, a polar bear hunting quota was allocated for indigenous populations in Russia and the US. Alaskans use it, but Russia has yet to lift its ban. "When the quota was issued, illegal poaching ceased almost completely. People here were afraid that, if caught, they wouldn't get one. Still, no permission has been granted, even though locals have been filing applications every year. As a result, they've grown tired of it, and have decided to lead the life they've always led. Poaching is on the rise again," Kochnev says. He adds that even if hunting is allowed, the issue of poaching can only be successfully controlled with oversight by the state and tight control within communities. Kochnev has repeatedly come across bears in the time he has spent researching them, but one encounter on Kolyuchin Island in 2003 left an indelible impression. It could have easily been his last. "There were 26 bears living there, but few walruses. The walruses would come on shore under rocks, which made it difficult for the bears to get meat. Once I was sitting below a slope watching the walruses. It was by sheer accident that I barely heard a sound in my mind. Turning I saw a bear about 20 meters away rushing toward me down the slope. It had a fiery look, and was salivating, nearly licking its lips," Kochnev says. All the researcher had with him was a stick, and he had time to take a few steps away from the slope. "The bear dashed toward me, and I lunged with my stick, and hissed. When bears hiss, they send out a warning that they might bite, not unlike cats. The bear stopped and thought, it seemed like it was unsure of what was going on. He shifted his gaze from the walruses close in the water to me. It seemed he had smelled the walruses from afar and decided I was one of them and up for grabs. Then, the bear backed a little, sniffed the stone I had been sitting on, and it dawned on him as he sensed my smell. He turned to me and I saw in his eyes that he was now aware of a human standing in front of him," Kochnev says. The bear proceeded to throw itself into the water, where it shoved the walruses and swam way. It is clear the animal was after walruses, not people, Kochnev says. But others might have interpreted it as a bear-on-human attempted attack. "It is a difficult thing to understand what an animal wants. People can carry sticks, thinking that if necessary they can scare the bear away, but to do so they need to have a deep understanding of bear psychology, to be able to deduce from its look, its movements, any turn of its head what it is up to. I would advise people without knowledge and experience against that. I'd rather they shoot the bear and stay alive," Kochnev says. A Chukotka government representative told RIA Novosti that the region has a plan of urgent measures to 2020 to preserve the polar bear. Under the document, a special commission was set up and several bodies are collaborating. Every year, law enforcement officers are involved in up to 260 raids to combat poaching. Authorities are engaged in work to prevent human-bear conflicts. A network of specially protected nature areas is under development, while economic activities are limited in bear habitats. "Experts put the number of living bears at between 2,000 and 5,000," the official said citing climate change and the resulting rise in conflict encounters with humans as the main threat to the species. He added that a set of measures had been developed to reduce the number of bear incursions. Locals are advised to remove waste from their villages, while older buildings are being taken down or mothballed. Lighting is being set up close to the coastline. Experienced hunters are being involved in mobile groups to scare bears away.